The Gold Coast Railroad Museum is one of three Official State Railroad Museums in Florida. and was founded in 1956. The museum was built on the former Naval Air Station Richmond (NASR). With over three miles of tracks, the old base was an ideal place to build a railroad museum. It became a Florida state railroad museum in 1984 when it received statutory recognition by the Florida Legislature. 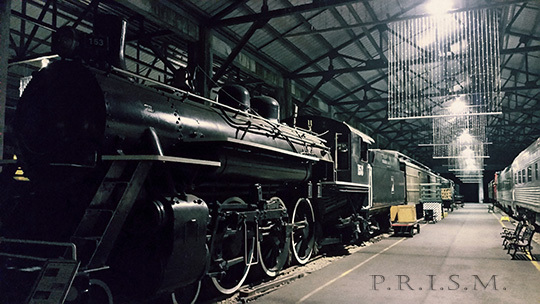 Its purpose is to preserve railroad history, it is devoted primarily to the history of railroading, it is open to the public, and it operates as a non-profit organization. The Gold Coast Railroad Museum promotes historical trains and railroads. It houses over 40 historic railcars including the Western Pacific "Silver Crescent" and engines like the Florida East Coast 113. One of the most important exhibits is the "Ferdinand Magellan", better known as Presidential Rail Car No. 1. PRISM Paranormal Research Florida hosted an event at the Gold Coast Railroad Museum in Miami, Florida on October 15, 2016. Founder of PRISM, David Pierce Rodriguez, conducted an electronic voice phenomena (EVP) session in the Seaboard Air Line Railroad (SAL) Dining Car with a Panasonic RR-DR60 audio recorder. Electronic voice phenomena (EVP) are mysterious sounds recorded on both analog and digital recorders which are only heard upon playback of the recording. Though often unidentifiable, some EVP are clearly voices and may in fact be a form of communication with the dead. This particular EVP was recorded in the Western Pacific "California Zephyr" Vista-Dome Car "Silver Crescent" train's Seaboard Air Line Railroad (SAL) Dining Car. The EVP is of a child saying what sounds like, "back seat", after Danielle Lebrecht Lamping, says, "Are you in the back of the car? Cross for yes.". Paranormal Research & Investigative Studies Miami (PRISM) conducted a paranormal investigation of the Gold Coast Railroad Museum in Miami, Florida on June 9, 2016 for Telemundo | Un Nuevo Día. Paranormal Research & Investigative Studies Miami (PRISM) con Telemundo | Un Nuevo Día el 9 de junio 2016. Investigación paranormal por PRISM de el Gold Coast Railroad Museum (museo del ferrocarril) en Miami, Florida. PRISM Paranormal Research Florida investigated the Gold Coast Railroad Museum in Miami, Florida on May 15, 2016 with ¡Mira que trending! (MiraTV). PRISM Paranormal Research Florida investigated the haunted Gold Coast Railroad Museum in Miami, Florida on April 16, 2016. PRISM investigators were founder of PRISM, David Pierce Rodriguez, PRISM paranormal investigator Eric Vanderlaan, and his son, honorary Jr. Investigator, Max Vanderlaan. Instruments used on this particular investigation were a full-spectrum modified GoPro Hero 3, 4K Action Camera, SJCAM SJ4000 Action Camera, K-II EMF meters, REM-POD, and an early-model Japanese Panasonic RR-DR60 audio recorder to record electronic voice phenomena (EVP). Multiple Electronic voice phenomena (EVP) were recorded in the Western Pacific "California Zephyr" Vista-Dome Car "Silver Crescent" train and the Seaboard Air Line Railroad (SAL) Dining Car. Though often unidentifiable, some EVP are clearly voices and may in fact be a form of communication with the dead. We would like to thank the Gold Coast Railroad Museum staff and the Haunted South Florida paranormal research team!